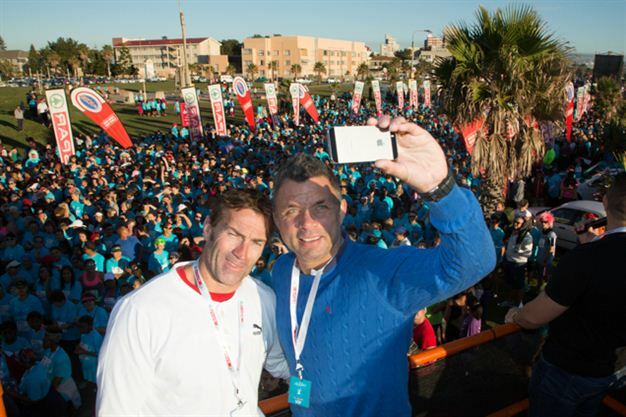 The Survivor SA: Champions Captains jump on the ‘selfie’ bandwagon at the start of the Spar Women’s Race in Port Elizabeth on 3 May. 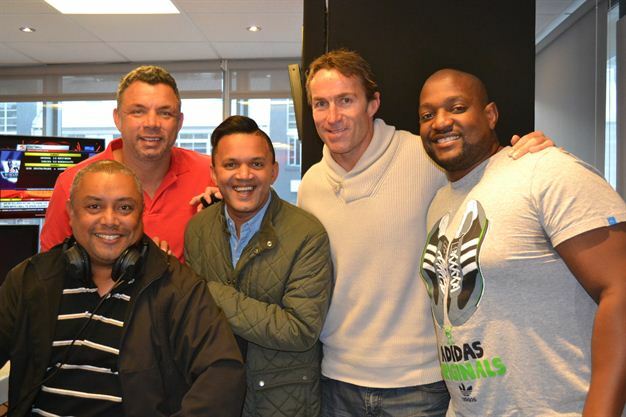 Corne and Mark popped in to East Coast Radio for a chat with Darren Maule from The Breakfast Stack. 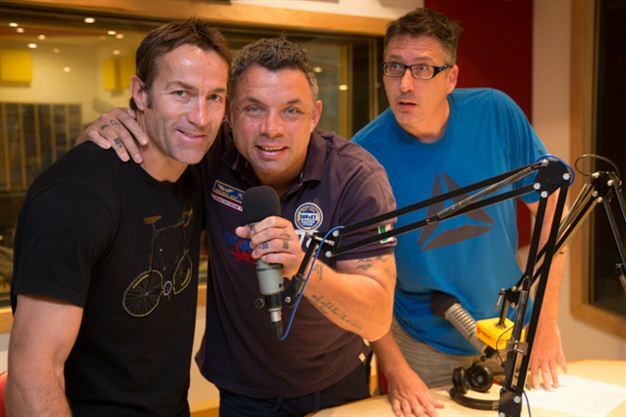 Mark and Corne on air with Darren Maule on East Coast Radio’s Breakfast Stack. 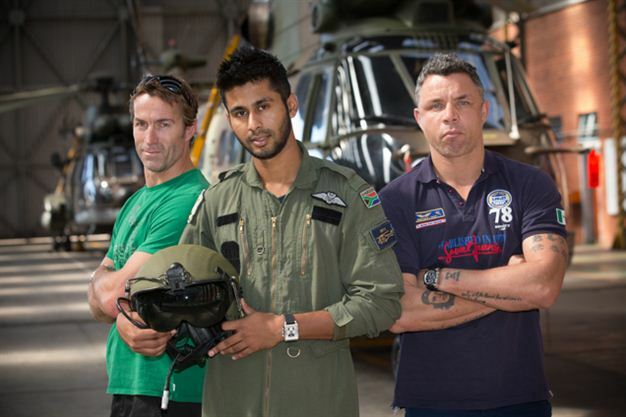 The Survivor SA: Champions Captains popped into the military base in Durban to visit recently-eliminated contestant, SAAF pilot Altaaf Sheik. 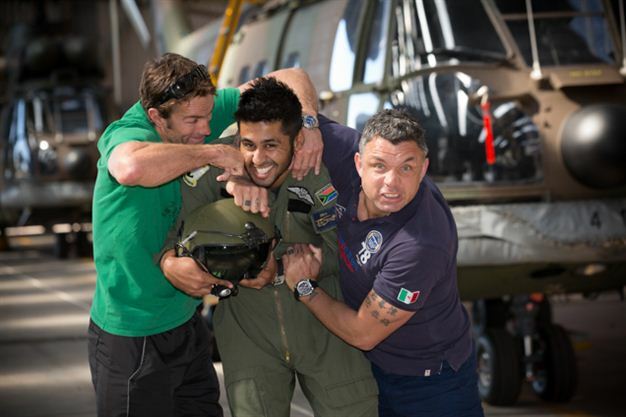 The Captains go all ‘Top Gun’ with former contestant Altaaf Sheik during a visit to the military base in Durban. 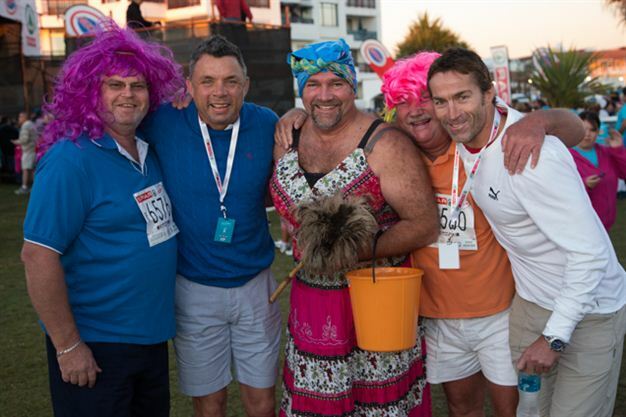 The Survivor SA Captains, Corne Krige and Mark Fish punish Altaaf for his antics at his final Tribal Council, where he emptied the bag of rice he’d won for his tribe, into the fire. 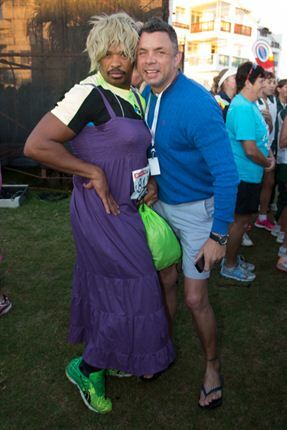 Survivor SA: Champions Captain Mark Fish cozies up to Protea cricket legend Makhaya Ntini at the start of the Spar Women’s Race in Port Elizabeth on 3 May. Makhaya visited the Survivor island during the filming of the series to participate in a challenge, but couldn’t help Corne Krige’s Selatan win the ‘crate smash’ challenge. 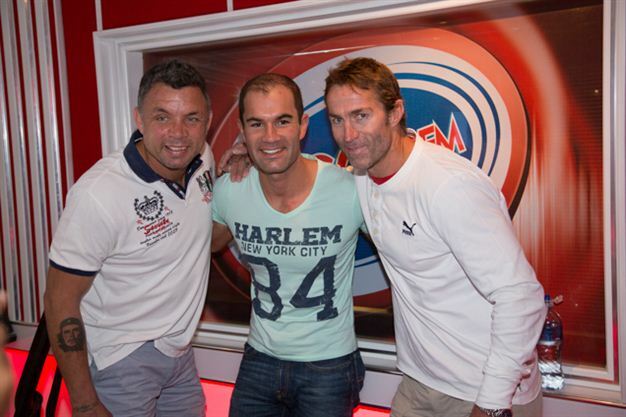 Survivor SA: Champions Captains Corne Krige and Mark Fish in-studio for an interview with Algoa FM’s Wayne Hart on the Top 30 Show in Port Elizabeth on 3 May. 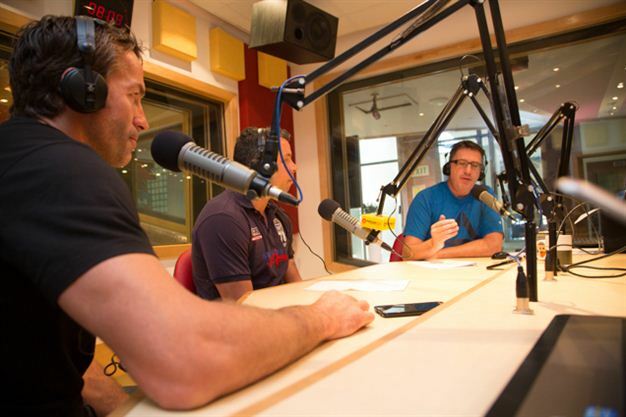 Survivor SA: Champions Captain Mark Fish chats to Algoa FM’s Wayne Hart during an interview on 3 May, as fellow Captain Corne Krige looks on. 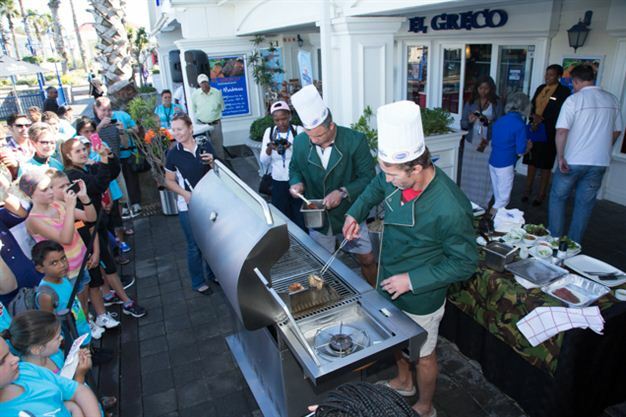 Survivor SA: Champions Captains Mark Fish and Corne Krige take on a cooking challenge at The Boardwalk’s El Greco restaurant in Port Elizabeth on 3 May. 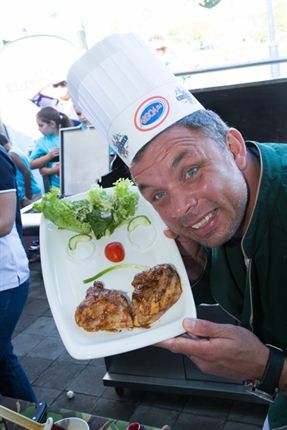 Judge Charl Leslie couldn’t decide whose chicken dish was better, but judged Corne’s flambe’d fillet as the winner in the second round. 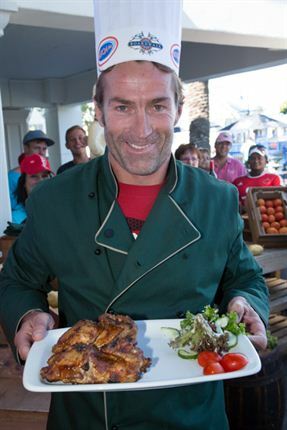 They’re no MasterChef contenders, but Survivor SA: Champions Captains Mark Fish and Corne Krige know their way around a braai! 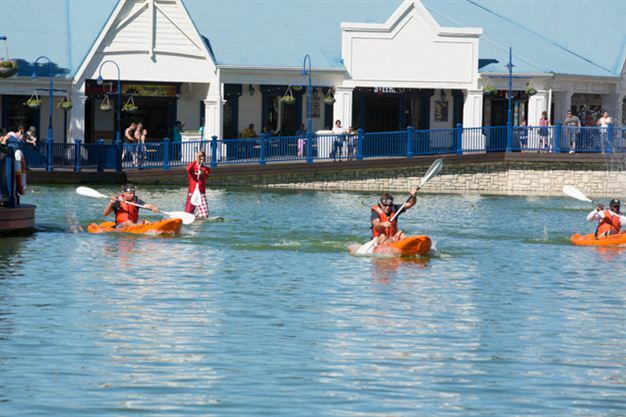 Corne Krige leads Mark Fish home in a kayak race across The Boardwalk’s lake in Port Elizabeth on Saturday 3 May. Corne set the pace from the start, leaving Mark trailing in his wake to notch up his second win on the Champions’ Challenge Tour across SA. 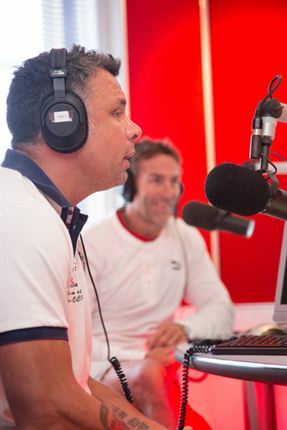 Corne leads Mark 2-0, heading into the final stop, Cape Town, on 4 May.